TELEMUNDO announced the list of nominees for the first ever “Latin American Music Awards,” which will take place on Thursday, October 8, 2015 at 9pm/8c from the prestigious Dolby Theater in Hollywood, California. Nicky Jam leads with six nominations, followed by five-time nominees Enrique Iglesias and J Balvin; while Calibre 50, Maná and Romeo Santos earned four nominations each. The network also announced the first line-up of artists to perform at the inaugural awards ceremony including iconic Mexican pop singer Gloria Trevi, popular regional mexican music leading man Gerardo Ortiz and powerful Italian pop trio Il Volo. The awards celebration will honor today’s most influential and iconic Latin artists, as voted by the fans in the traditional format of the “American Music Awards,” the world’s biggest fan-voted award show. The two-hour show will feature performances by chart-topping talent in both English and Spanish, with a one-hour red carpet pre-show special at 8pm/7c. The program will also broadcast simultaneously on NBC Universo. 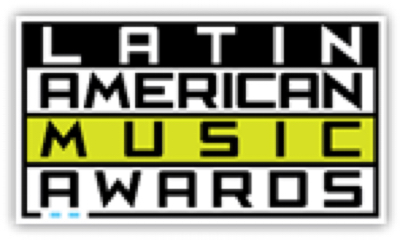 Starting today at 12:00pm/11c, fans from the United States and Puerto Rico are able to place their vote online at www.LatinAMAs.com/vota, and fans worldwide can vote via Twitter by posting a tweet that contains first and last name of the nominee, category and the hashtag #LatinAMAs. Artists nominated for three awards include: Ricky Martin, Plan B, Julion Alvarez y su Norteño Banda, Juan Gabriel, Daddy Yankee and Banda Sinaloense MS de Sergio Lizarraga. Those with two nominations are Camila, Chino y Nacho, Chiquis Rivera, DJ Snake, Gente de Zona, Gerardo Ortiz, Prince Royce and Zion & Lennox. Forty other artists or musical groups received one nomination each.